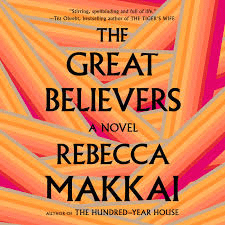 The opening chapter of The Great Believers is a beautiful, chilling foretaste of the epic story that awaits in Rebecca Makkai’s new novel. It’s autumn 1985, Chicago. Yale Tishman and his partner, Charlie, are at a party to honor the life of Nico, the first in their close-knit circle to die of AIDS. Nico’s family has announced that his friends are not welcome at the funeral, so Richard has gathered everyone at his Lincoln Park house to eat canapes, watch a slideshow, and drink a considerable amount of rum in a nod to Nico’s Cuban heritage. The celebration is loud, boozy, and attended by all the men—and plucky Fiona, Nico’s devastated younger sister—who will come to populate the pages of The Great Believers. As they flood Richard’s living room in a display of grief and tenderness, Yale loses his grip. “How had [he] forgotten he hated rum? It always made him moody, dehydrated, hot. His stomach a mess.” He heads upstairs to splash cool water on his face and take stock of his sorrows. In the hush of the bathroom, he finds himself mentally reviewing his “sick list,” ticking off the names of friends who aren’t careful enough, friends who might get sick, friends who might already be sick. He can’t grasp the escalating AIDS epidemic, but he knows it’s bad. When Yale returns to the party, he notices something is very wrong. “He opened the door to the hall and heard a collective silence, as if they were all holding their breath, listening to someone make a speech… Only…there was no one in the living room… The foggy, ridiculous idea came to him that the world had ended, that some apocalypse had swept through and forgotten him.” His friends have in fact vanished, but not from an apocalypse. We learn the reason for their disappearance later, but this agonizing scene of Yale standing alone in an empty room channels the desolation yet to come. But stay with me: this book is not all doom and gloom. It’s abundant and colorful, and it pulses with courage, dialogue, and fleshed-out characters that steal your heart. Makkai conducted four years of research to render the AIDS crisis in Chicago’s Boystown in the 1980s, so it’s no surprise that her story is rich with detail. It is also layered with themes that will resonate with many readers: loss, separation, parenthood, and the power of art, to name a few. After the haunting first chapter, The Great Believers takes off. Yale’s career is in full swing at an art gallery at Northwestern University, where he has just met Nora. Once an artist’s model, the elderly woman wants to donate her private cache of paintings from 1920s Paris. Yale’s quest to safeguard this art leads to unforeseen challenges and ultimately changes the course of his life. Yale’s story alone is ambitious, but Makkai incorporates a second plotline. In alternating chapters, she jumps ahead 30 years to 2015. Fifty-something Fiona is visiting Richard (yes, Lincoln Park Richard), now a world-renowned photographer living in Paris. She’s staying at his house, walking the same streets that young Nora once did. At the same time, Richard is preparing for an exhibit of his work from the 1980s, documenting Chicago’s AIDS epidemic. Under Richard’s roof, Fiona literally comes face-to-face with her past, and she is forced to undergo a necessary reckoning. There are many moving parts to The Great Believers; some link and overlap, others don’t. The result is a sprawling, generous and messy book, perfect for readers who want to lose themselves in a different, all-consuming world.